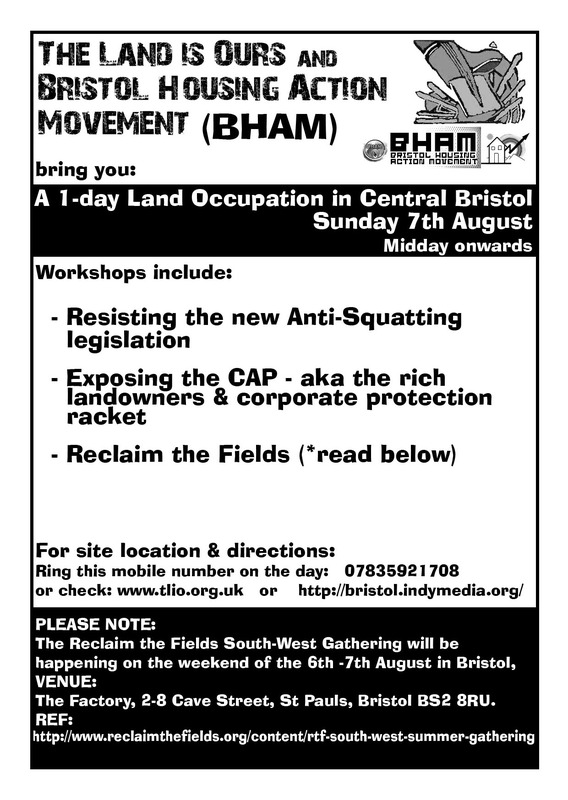 TLIO & Bristol Housing Action Movement (BHAM) in association with Reclaim the Fields organised a land occupation in St Werburghs, Bristol, on Sunday 7th August 2011 . Read the report below as to what happened (see flyer advertising the event on the right including details of Reclaim the Fields SW Gathering the same weekend which this event merged with). 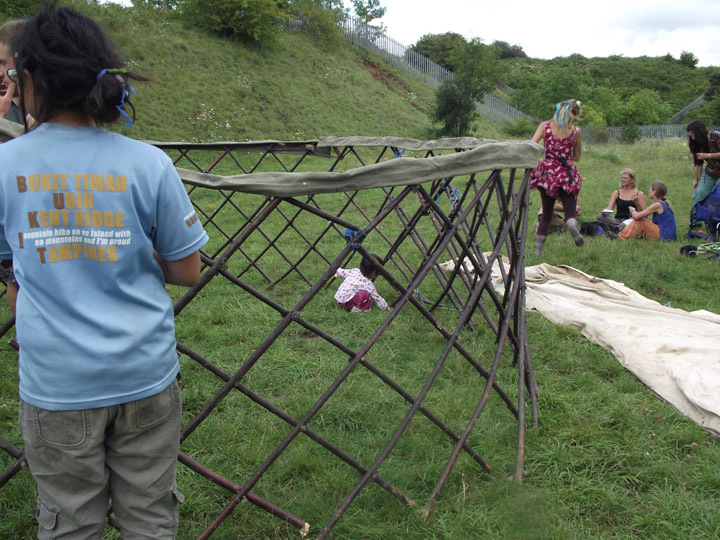 The first stage in yurt assembly: securing the walling of the yurt to hold it in place (made of chestnut). (all photos’ taken with permission of people in photos). On Sunday 7th August, TLIO, Bristol Housing Action Movement (BHAM) and Reclaim the Fields occupied a piece of land in St Werburghs, just North of inner-city Bristol, called “Narroways Hill” – well-known to Bristolians and known locally simply as “The Hill”. Narroways Hill is a little grassy & wooded ridge dissected by railway lines and is an area of outstanding natural beauty (non-officially designated), located via a public footpath at the end of Mina Road. A former railway embankment, this area of green space lined and interspersed with small woods and flanked by a steep railway embankment on one side was purchased by Bristol City Council in the late 1990s. It became a Millennium Green in the year 2000, with a 999 year lease to keep it free and open to the local people and allow wildlife to thrive. Since 2000, it has been owned by the Narroways Millennium Green Trust, who manage it as a nature reserve. We got onto the site later than planned at 1.30pm for this 1-day land occupation, an event we arranged for the purpose of providing a space for workshops and discussion, plus outdoors activity such as plant id to take advantage of being in an area of great environmental value. TLIO, Bham and Reclaim the Fields sought to tread lightly on the ground there; our intention was not to use groundsheets, and to confine our occupation to one section of the flat ground area of chalk grassland below the steep railway embankment so as not to disturb such rare grassland species such as Field Scabious, Bird’s Foot Trefoil, Greater Knapweed and Sainfoin present in the chalk grassland (the grassland is apparantly also home to butterfly such as Marbled White, Common Blue and Small Copper). 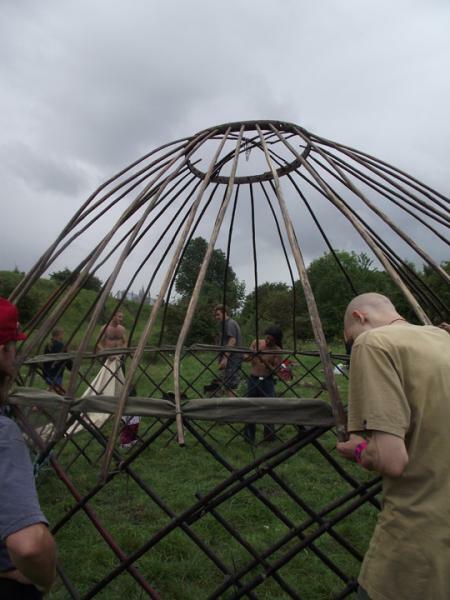 * As soon as we got onto the site, we got on with the business of erecting the yurt (now owned by BHAM) and later on a 20 x 20 marquee. A fire was lit on an existing fire-pit using wood we took onto the site, for the purpose of cooking food. [*we were only made aware of the environmental sensitivity of some of these rare species upon arriving on the site by a member of the trust; however, we continued in the full-knowledge that our occupation would have a low-impact as was our intention since we expected no more than 30-40 in attendance, which proved to be the case at any one time]. First workshop was from a guy from the Squash Campaign (http://www.squashcampaign.org/) – a new campaign which set up several months ago to coordinate a campaign against the government’s proposals to ‘criminalise squatting’. The Government announced in June that it intends to bring in legislation at the start of 2012 (to be in force ahead of the Olympics perhaps?) to make occupying a private property illegally a criminal offence, launching a consultation on the proposals at the time. He gave a detailed talk about the government proposals, the government consultation and the incidence of concerted biased media reporting against squatting in the lead up to the government announcement of their proposals and Squash’s detailed multi-pronged response – for instance, Squash’s attempts so far to counteract the negative media against squatting through press releases, press briefing papers, the online campaign and zines. The speaker also mentioned what is possibly the most significant project Squash may be doing at present, which is to conduct a research study into the extent and breadth of squatting across the UK, which will be peer-reviewed and completed ahead of the appearance of any potential government legislation should it arise. The government’s proposals will not include previously announced plans to make any unauthorised access to land a criminal offence, such as camping on private land, under a mooted new law of ‘Intentional Trespass’ which seems to now have been abandoned. After that, whilst most people went off to explore the site doing a foraging/plant id trail, some people continuing making seeds bombs and a few others went about starting to prepare hot food, daal and chapattis, which was richly enjoyed by all later on. After most people had reconverged after food, James Armstrong from TLIO then gave a workshop on the subject of the Common Agricultural Policy (CAP) – as a protection-racket for large landowners and corporations. James first began by quoting examples of CAP recipients and the amount of money they have received, such as the Queen who got £1,183,508 over 2 years just for privately-owning Sandringham (20,000 acres), £81 million to British Sugar in 2009 for building a biofuel plant, and £19 million per annum to sugar/biofuel broker Czarnikow (E129 million across Europe; Tate & Lyle across Europe get E828 million). The figures for the UK-only were retrieved from the DEFRA website, but are now no longer available following an annoucement by the government that it would not be in the public interest to reveal these figures belonging to the Royal Family! (read here). James revealed how even getting an official figure of the UK’s contribution to the EU proved exacting, after no reply from the Office of National Statistics (it was finally revealed by the Treasury in a written correspondence; puzzling however how the figure quoted of £10.3 billion was ommitted from the Annual Abstract of Statistics by the ONS). After explaining the origins of CAP and how the new system of Single-Farm Payments (reformed from the previous system of production-subsidies) still rewards the largest landowners, this time quite unashamedly in accordance of land-area, he went onto a discussion around the subject of comparing this situation with the original objective of what CAP actually stands for – which was to “reward agricultural-workers” (Treaty of Rome). In a situation of widespread closures of small farms, the merits of this were discussed. James identified that in order to maintain a fig-leaf of public accountability, the EU issued a questionnaire on the CAP as part of a consultation over it’s ongoing reform. However, the EU managed to get just 196 respondents to the questionnaire in the entire UK!!! James also identified how this questionnaire was filled up with loaded questions, such as “do you believe agriculture is important in the EU?”, suggesting the existing framework should continue which a positive response from a respondent would consent to. James then briefly introduced his own questionnaire, which he had been doing all afternoon to people individually. In it are questions about the reality of the CAP, (ie; who it benefits, amount of money for whom, asking people’s opinions on whether these aspects are a good or bad thing). We also touched on the subject of supermarket power and further trends in agricultural intensification with megafarms and related animal welfare issues. By the end of this workshop, we decided it was time to pack up, which we did in no time at-all. Then, as we proceeded to leave the site, 4 members of the Narroways Millennium Green Trust caught up with us, to complain about our occupation on the land, claiming we were disturbing an important area of wildlife and rare flora. After some discussion, we were able to appreciate eachother’s concerns, with our reassurance of our “tread lightly” intentions taken on board, including the fact that we did not start a new fire pit, instead using an existing one (one of a few there). It was acknowledged by the trust members that over this summer and previous ones, there has been a frequent incidence of Saturday night parties on the top of the embankment, and so, the area is flooded with people on a regular basis, which they suggested is a main reason why species count of the rare chalk grassland plants on the site have reduced over the course of time the trust has been managing the land! This situation brought to attention the conflict between land access and conservation protection. The 4 trust members accepted our view that access cannot be denied – access which gypsy travellers for instance have long enjoyed. Meanwhile, we accepted that access is best regulated on a site with sensitive environmental value. We suggested that an area should be earmarked to be not trampled on, save from fencing it off. There was some discussion about whether providing a designated fire-pit alongside clear signage prohibiting open fires on the grassland would be a good idea. The merits of this included discussion on sourcing the wood, as depletion of wood, twigs etc from the area denies local invertebrate life, which in turn has a negative effect up the food chain. Providing a wood pile and having a regular community fire each Saturday night in the Spring and summer were suggested as options for the trust to consider so as to provide a presence in the area so that if open-air raves came onto the site, it might afford protection to the area of chalk grassland as revellers might stay clear of walking down the embankment to a known presence below (or starting up fires). This suggestion was not made to encourage liason with noise abatement regulation from the council, but which would be the local community’s prerogative. Again, it raises the interesting issue of how far access should be extended when environmental considerations are important. It raises the question of to what extent regulated access means access is determined on conditions laid down by the local community. This is an important issue. An additional point, to make, however, as identified in our workshop on the CAP, is that with the nature of wildlife desertification across vast fields of sterile industrial monoculture farming in Britain (vast acres of which as far as the eye can see we are not allowed to walk over), it is for this reason why a site of rare chalk grassland such as this is afforded such rare status as a direct result of the fact that it is rendered an island of rare biodiversity. Reform of CAP steered back in the direction of small farmers and smallholders would single handedly improve this situation. All the major conservation groups dare not tackle the impacts of agriculture because they rely heavily on support from farmers and farming interests to support their work. But more than that, if you look at the objectives of many leading conservation groups they’re framed by the class interests of the farming lobby. If we want to keep that ecological diversity we must reverse the industrialised farming model to some extent, to create wildlife corridors, a process partly underway through cross-compliance with the Single-Farm Payment and associated environmental stewardship schemes. However, existing trends in the guise of subsiding large farm enterprises and large land holdings are both marginal and also counterproductive. The best way to achieve this transition will be to have a step change away from industrialised farming practice, to have value-added production closer to the producer with the producer linked more directly to the consumer, and to catalyse this “step change” through a radical reform of land rights to dismantle the historic concentration of land ownership that’s existed since the Norman Conquest. The Reclaim the Fields South-West Gathering was held on the weekend of the 6th -7th August in Bristol, venue: The Factory, 2-8 Cave Street, St Pauls, Bristol. Click here for TLIO’s Autumn gathering which will be a bigger and more comprenhesive event than this quick flourish above. 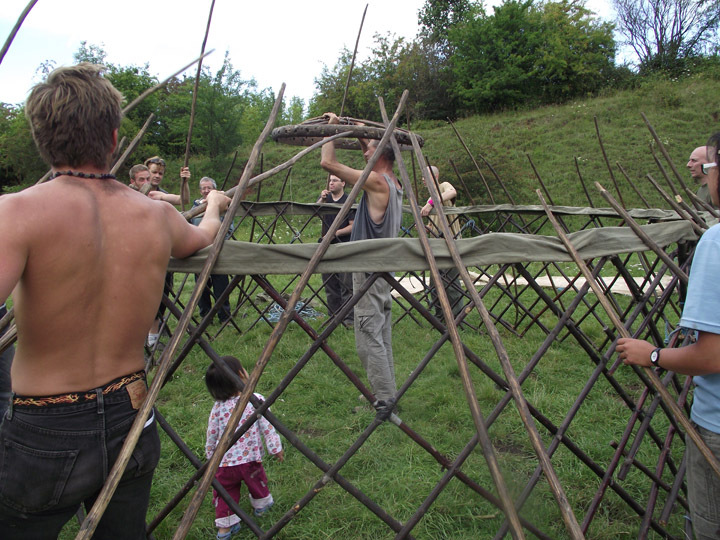 The TLIO AUTUMN Gathering will take place on the weekend of Sat 8th to Sun 9th October this year at Monkton Wyld Court, near Axminster, Dorset. Places will be limited so book early.